In Samford University’s College of Health Sciences, the School of Public Health strives to educate students on the determinants of health, while equipping them with appropriate solutions to promote health and remove barriers locally and globally. 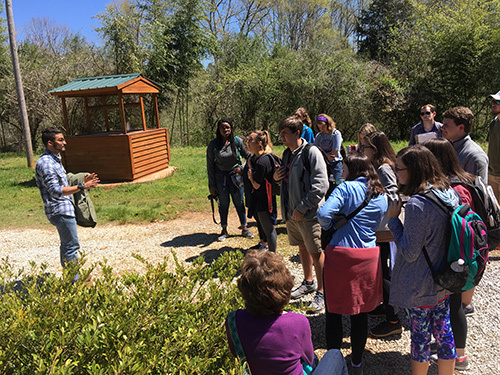 Students in assistant professor Kim Davey’s and associate professor Rachel Casiday’s undergraduate public health courses were able to experience these problems and solutions firsthand during a visit to Servants in Faith and Technology (SIFAT) in Lineville, Alabama. SIFAT provides students with the opportunity to see conditions and issues regularly encountered in the field of public health and to learn how to address these needs in appropriate and sustainable ways. The trip exposed students to topics such as sanitation, water filtration, indoor air pollution and many more. Duke shared her favorite part of the experience: cricket farming. “It is more sustainable and takes fewer resources to raise, eat and sell crickets than cows. We even got to prepare and eat some crickets, which were pretty good. This trip furthered my passion for going into communities and teaching and helping people live healthier lives,” Duke said. In the afternoon, faculty and students walked through SIFAT’s “global village,” which replicates housing conditions in different areas of the world, including slums. This is the second year Davey and Casiday have led the trip to SIFAT, and it definitely will not be the last.